Protein itself does not have much of an effect on blood sugar levels, though the food the protein is in may. Typically, people with diabetes don't need any more protein than people who don't have diabetes. There are, however, times when less protein is better. Protein is one of three essential macronutrients; the other two are fat and carbohydrate. These are needed in large amounts to maintain health and vital functions. The body uses protein to build, repair, and maintain most of your body's tissues and organs. Proteins are also necessary for immune system function and they help some additional physiological processes. As long as your kidneys are healthy, about 15 percent to 20 percent of your daily calories should come from protein. This is the same amount suggested for a balanced non-diabetic diet. About 45 percent to 50 percent of your caloric intake should come from carbohydrates and the rest should come from fat. A person who needs 2,000 calories per day needs about 75 to 100 grams of protein per day. It would be more accurate, however, to use the standard formula of 0.8 grams of protein per kilogram of body weight. To do the kilogram conversion, divide your weight in pounds by 2.2. For instance, if you weigh 150 pounds, that is equal to 68 kilograms. Divide that by 0.8 and you get a protein goal of 85 grams. According to the USDA Dietary Guidelines, it is recommended to eat 5 1/2 ounces of protein-rich food each day. 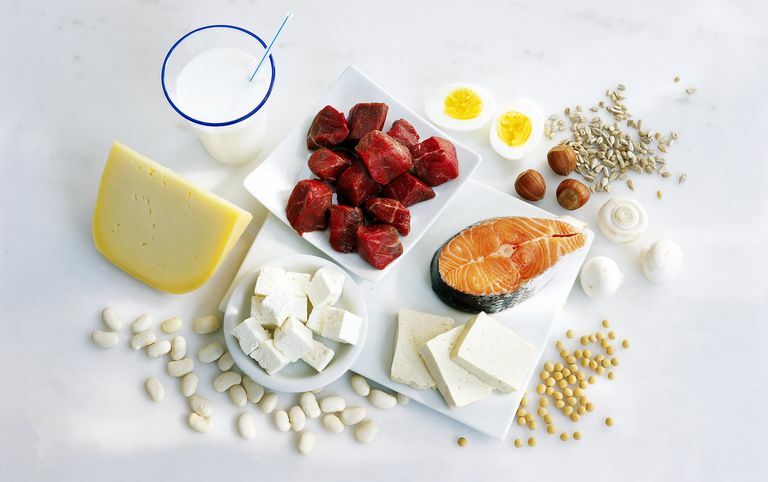 Foods that are high in protein include meat, fish, seafood, chicken, eggs, dairy products, legumes, nuts, and seeds. When choosing proteins for a diabetic diet, the concern is more with the fats and carbohydrates that these foods contain. Some types of carbohydrates, for instance, are quickly converted to glucose, which may lead to a spike. Additionally, the risk of weight gain from high-fat and high-carb foods can lead to less control of blood sugar levels. The American Diabetes Association recommends eating fish as a protein source at least twice a week. They also recommend limiting red meat and processed meats like ham, bacon, and hot dogs because these tend to be high in saturated fats. Lean meats are a better choice for a balanced diet. Research has shown that increasing protein intake doesn't appear to have any appreciable impact on how your sugar is digested or absorbed. And it doesn't have any long-term effects on your blood sugar or insulin requirements. This means that if a person with diabetes switches to a high-protein diet, any therapeutic benefit is probably due to the concurrent reduction and closer regulation of carbohydrate consumption, not to any particular intake of protein. This is an important basis for a consistent carbohydrate diet, which can help control type 2 diabetes. That is not to say that high-protein diets are right for everyone. You need to take your personal situation and eating habits into account. For instance, studies have been done on meals that are high in both fat and protein. In people with type 1 diabetes, their insulin dosage needed to be increased after one of these meals. Due to this, researchers recommend close monitoring of glucose levels. People who have diabetic nephropathy, which is a kidney disease related to diabetes, often need to eat less protein. In this case, the recommended protein intake is about one gram (or less) per kilogram of body weight. You will need to work with your healthcare provider to determine how much protein you need each day. Too much protein might be bad for your kidneys, but too little protein could lead to malnutrition and unintended weight loss. Anyone with diabetes can benefit from a personalized protein intake recommendation as well. There are many factors that play a role in a well-balanced diet and your needs may be different from the general recommendations. It's best to speak with your healthcare provider about your protein needs. You can also discuss it with a certified diabetes educator or a dietitian or nutritionist who specializes in medical nutrition therapy for people with diabetes. While protein does not seem to directly affect blood glucose levels, the other components of high-protein foods may. Keep this in mind and try to limit your proteins to the daily recommended amount and to foods that are low in fat and carbohydrates. American Diabetes Association. Protein Foods. 2017. American Diabetes Association. Lifestyle Management: Standards of Medical Care in Diabetes–2018. 2018;41:S38–S50. Diabetes Care. doi: 10.2337/dc18-S004. Bell KJ, et al. Impact of Fat, Protein, and Glycemic Index on Postpradial Glucose Control in Type 1 Diabetes. Diabetes Care. 2015;38(6):1008–1015. doi: 10.2337/dc15-0100. The United States Department of Agriculture. Dietary Guidelines for Americans 2015–2020. 2015. Should People With Diabetes Use Low-Calorie Sweeteners?